High Quality Content by WIKIPEDIA articles! Toila is a small borough (alevik) in northeastern Estonia. It is located in Ida-Viru county, some 10 km northeast from the town of Jõhvi. 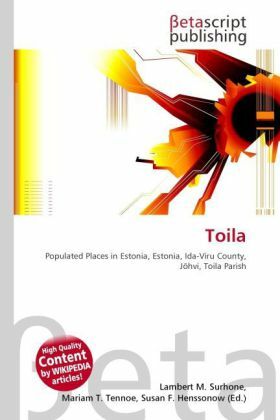 Toila is the administrative centre of Toila Parish and has a population of 896 (as of 1 December 2008).Toila lies on the coast of the Finnish Gulf and is an important sea resort in Estonia. Toila is known for its beautiful park (Oru Park), spa hotel and beach. From 1934 to 1940 Oru palace in Toila was the summer residence of the Estonian president Konstantin Päts. The palace was destroyed in the Second World War. Toila has also a small fishing and yachting port.